Abstract: Powercolor's Theatre 550 Pro TV tuner is based on ATI's Theatre 550 Pro digital audio/video processing chipset. Installation of the PowerCinema 3 software was straightforward, and the program consumed about 90MB of drive space. Initial setup involved choosing between a 4:3 or wide screen display, audio output, video input (cable or antenna) and country (very poorly implemented, it took us about 3 tedious minutes to click from United States to Canada since no dropdown box was available for instant selection). Once this is done, the program can auto scan for currently available channels, scan your drives for music files. The PowerCinema program uses a pleasingly sparse interface with large type, making finding what you are looking for very simple. Obviously, this kind of interface is essential for viewing on conventional TV screens, due to their relative lack of definition compared to CRT or LCD monitors. We definitely enjoyed the look and feel of this program. After a few hours of use though, we ran into a couple of irritating problems which mitigated our enjoyment of this software. More on this in a second. The PowerCinema program has six major modes: Movie, Video, TV, Pictures, Radio and Music. Each of these choices opens a corresponding menu for playing that type of media. The 'video' menu also allows video capture, and the 'TV' mode functions as a PVR (Personal Video Recorder), allowing you to pause and rewind live TV. This is accomplished by streaming the video data to your drive constantly. The temporary file created for this purpose is erased when the 'TV' application is closed, unless you specifically hit the 'record' button. 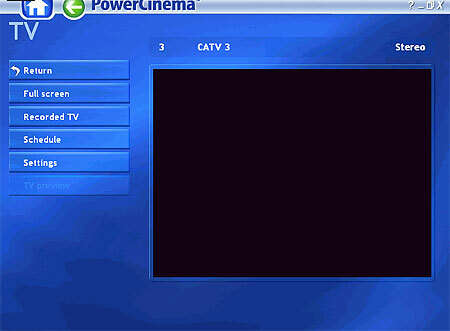 PowerCinema 3 is definitely oriented towards home users, and as such uses a very simplified interface. The video quality settings are abstracted to 'good', 'better' and 'best', with 'better' being the default. The Movie, Music, Radio and Picture playback portions of this software worked well but unremarkably, and we won't comment further except to say that they are more than adequate to fill the needs of home users. 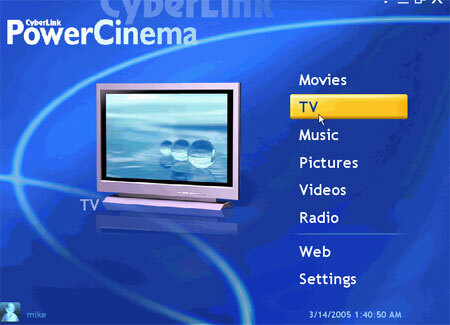 The 'TV' PVR application within PowerCinema was our favourite thing about the software. The TV signal is encoded, compressed and streamed to the hard drive constantly, while a slightly delayed version of the signal is displayed onscreen. Viewers can pause or rewind the signal at will, then fast forward if necessary. Image quality does suffer slightly in this mode, as what you are viewing is actually a compressed signal, but in our experience the effect was minor.